The weather this weekend inspired us to not do a whole heck of a lot except cook. Well, Jay cooked and I cleaned up after him. Grace and I ventured outside for a bit to go to a pet store to say hi to a friend. We knew that dogs would be there from a pug rescue, but turns out doggies from the golden retriever rescue were also there. It was dog heaven for Kate! Grace got sniffed by doggies big and small and didn't seem to mind too much. Someone at the store asked me, "Is she going to be a dog lover?" I relplied, "She has no choice." Seriously though, I think she's decided she likes dogs. 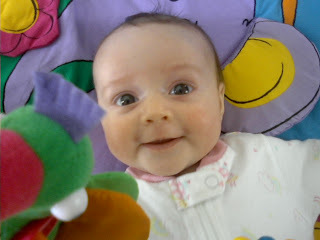 Sometimes when she watches Ella she'll break into a big smile. We'll try to capture that soon. Most of the images we've posted of Grace show her either being swaddled or held. The reality is that she's is quite the alert and active little bugger. See for yourself. We've had a calmer Gracie lately. After Grandma Gorman watched her last Wednesday we changed our routine a bit. Grandma had a really calm day with baby, only one cry and I was wondering why I never experienced that side of Grace. The main thing that was different when someone else watched her that she was bottle fed. Hmmmm. Maybe she was getting more to eat at each sitting and thus was full for longer periods of time. 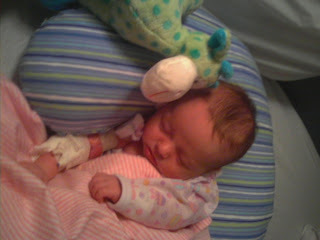 Sure enough, when I extended the duration of nursing sessions she was a much more content Gracie! I took Grace to the pediatrician for her well-child check up on Friday -- the one where she gets her first round of immunization shots. The nurse walked in and asked, "Mom, are you ready for this?" Since I'd already had to watch Grace go through many medical tests (including the spinal tap) when she had the fever/eye infection, I knew I could make it through this set of shots without crying. Gracie, on the other hand, let out a mighty yowl when the first needle went in. Still, she calmed down quickly once I picked her up. The nurse also did measure-ments at her appoint-ment. She's in the average percentiles for head circum-ference and weight but she's in the 90s for height. She might be a lean tall girl, which would definietely help her get that swimming or volleyball college scholarship we're hoping for : ) She's gotten so long lately that she no longer fits into the sleeper she's wearing in this photo. She's still a little peanut though. Well sort of. I am going in to work once a week for the next month and Jay's taking over parental duties on those days. Yesterday was my first day back and I indeed missed Gracie. Sure, it was nice talking to adults all day and it was also nice to not have to think about the topics of diapering, feeding or napping. That said, I was constantly wondering what was going on at home. Good thing Jay called with updates and he even sent this photo of Gracie in her Minnesota Wild outfit. Go team! I'm so glad that I'm able to slooooowly transition to going back to work because I'm not ready to leave Gracie five days a week just yet. Plus, I haven't developed a morning routine -- coordinating feeding, changing and all that fun stuff -- that will allow me to get to work on time. Speaking of mornings, as I was getting ready to leave the house I put my hands in to the pockets of my dress coat and found pacifiers in both sides. I imagine this is just the first of many times that I'll discovering random items in odd places. Our anniversary was this weekend and Grace gave us the gift of 7 hours of continous sleep on Friday night. We greatly appreciated the gesture. Since that night though it's been back to fragmented sleep, which is to be expected of an 8 week old, especially since we're messing with her slumber situation. Not only have we started putting her to bed earlier, we also took her out of a sleep positioner that she's been in since her first week home. Thus she's been a restless sleeper (is that an oxymoron?). So restless in fact that when I put her down for a nap she gave herself her first scratch on her pretty face. Poor little girl. Grace is discovering her hands. She's grabbing a lot more which is fun to see and sometimes fun to feel. She's also starting to figure out that hands can be better than pacifiers since they're always accessible. Grace will also try to soothe herself by sucking on whatever is close to her mouth. Zippers, fingers, blankets (see photo), Jay's shirt -- she does not discriminate : ) This means that there are slobber spots everywhere, but better that than a fussy baby.